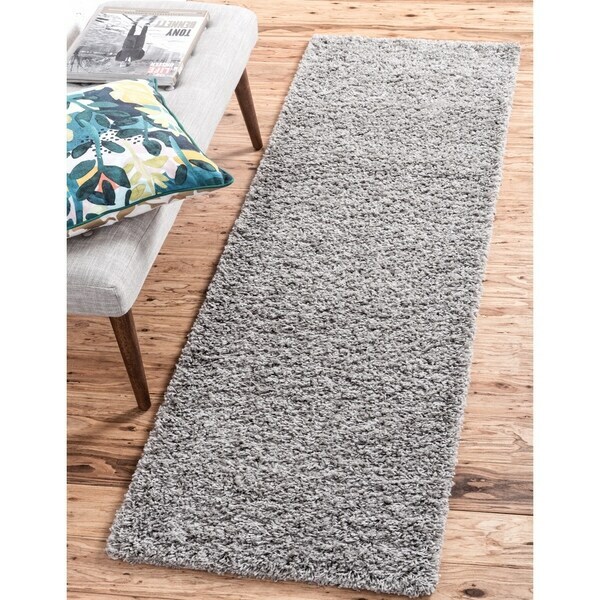 I love this rug, the color, texture, the price, I purchased a matching runner after I received the rug, I knew it would be equally perfect too. Dimensions 77.0 In. X 26.0 In. X 1.0 In. The most awesome rug I have ever had!!! It is beautiful orange and shag. The price was so low. I am so very happy with this purchase. I use it in my bedroom next to my bed and it matches my comforter perfectly. The size fit down the side of my bed. It actually makes my bedroom. I am happy with this purchase. The color is as pictured. Rich and bright. Soft to walk on in my bare feet. I really enjoy this rug, however; it easily sheds and I find little tufts of orange everywhere. Other than that, really like its' vibrancy! I received my rug today which was earlier than I expected!! I am so pleasantly surprised!!! It's even prettier than I had hoped for and look great in our RV. This rug looks to be very high quality and I couldn't be more pleased. I highly recommend it. The color was perfect! Definitely a taupe! Very soft under your feet and fits perfect at our dual sink vanity. Nice runner thicker than i thought. Color is perfect match with my print shower curtain. Really like the item. This is even nicer than I expected! There is a nice 'security edging' to keep it in place. It has a good thickness to it and is a moderate "shag". I would definitely recommend it. Very good quality. 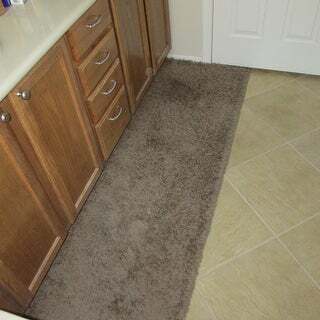 This runner turned out to be the PERFECT size in front of the double sinks in my master bathroom. The area between the tub and outer wall measured 79" and I could never find any type of rug or rugs that would cover from end to end. Stumbled upon this odd sized runner and it fits like it was custom made for the space. Lays flat. Easy to vacuum. Nice to walk on too--even with bare feet. This runner provides a nice pop of color. This is a beautiful earthy orange. Exactly what I was looking for! Love the texture and "shag" of these rugs - I bought two and placed them near the bed, much better than hitting the cold floor in the morning! Poorly made. Black mat with white rug loops emphasized how thin the rug truly is. Returning, very disappointed. Return cost was over half of purchase price...not enough savings to risk the cost of return if unhappy with Overstock merchandise. I love the design of the rug but wish it was a bit thicker/softer. Very poor quality. backing even shows through. The rug is ok but the actual color doesn't match the picture. I bought the white one for a bedroom and was disappointed in the quality of the rug. The shag itself is poorly made and not very thick at all. It was more of a hassle to return so I just kept it. Not plush at all. Sparse hard yarn loops make up this rug. It's horrible. Don't waste your money. Just like the picture very nice. I would recommend rug pad. It’s really nice to walk on very deep and vibrant. Love, love, love the color. Looks like a nice quality rug. Bought it for runner in front of dresser. Plus shag style rug. "Are these rugs machine washable." We do not recommend machine washing these rugs as this can damage the rug. Our recommendation for cleaning is vacuuming regularly with a raised beater bar and using a light detergent for spot cleaning.